This year’s World Cup is said to be the most digitally connected event on the planet to date. Countries from all around the world are streaming the games online, and brands are trying to tap into this unprecedented fervor as they create ways to connect with the digitally driven global audience. ESPN has become the top destination for free online streaming during this year’s World Cup. The WatchESPN website and app hit record numbers with 1.7 million viewers in the second half of the US vs. Germany game, surpassing Super Bowl viewership recorded at 1.1 million viewers. As more and more people continue to adopt online streaming to watch the World Cup, it gives brands the opportunity to create real-time marketing campaigns on multi-device platforms. Twitter has become the hub of social engagement for the World Cup. With its number one trending #WorldCup hashtag, the platform has created custom pages for each of the participating teams to provide updates instantly to fans. Twitter reports that 350,000 tweets per day are on the topic of the World Cup, and that 3.6 billion people are expected to watch worldwide - nearly 50% of the world’s population. Brands that are scoring big during the World Cup are acting globally by creating universal messages that resonate across all cultures. Effective brand advertising campaigns must appeal to viewers’ emotions while also unifying the global audience. Coca-Cola has gotten international attention with an innovative and compelling campaign capitalizing on the world’s passion for the World Cup. As an official sponsor, Coca-Cola’s global campaign encouraged fans to submit photos for a chance to be a part of the “Happiness Flag,” which was unveiled before the opening match game in Sao Paulo, Brazil. The “Happiness Flag” represents the idea that although we are from different backgrounds and cultures, the sport of futbol brings us all together. The digital version of the flag will live on http://www.happinessflag.com, where consumers can see an aerial shot of the flag and hover over the mosaic to further explore the photos. Fans who submitted photos will received a link to see exactly where the image is on the flag, and are, of course, encouraged to share their photo on social using the hashtag #worldscup. While Adidas is the official FIFA (The Fédération Internationale de Football Association) sponsor, Nike has seen great results with their World Cup campaign #RiskEverything. The message of “Risk Everything” resonates with both athletes and viewers across the globe with a message that in order to reach your highest potential, you have to have courage instead of playing it safe. This message spoke to the story of the World Cup and has generated over 50 million online views, more than 92,000 Tweets, and 673,000 and counting social interactions. 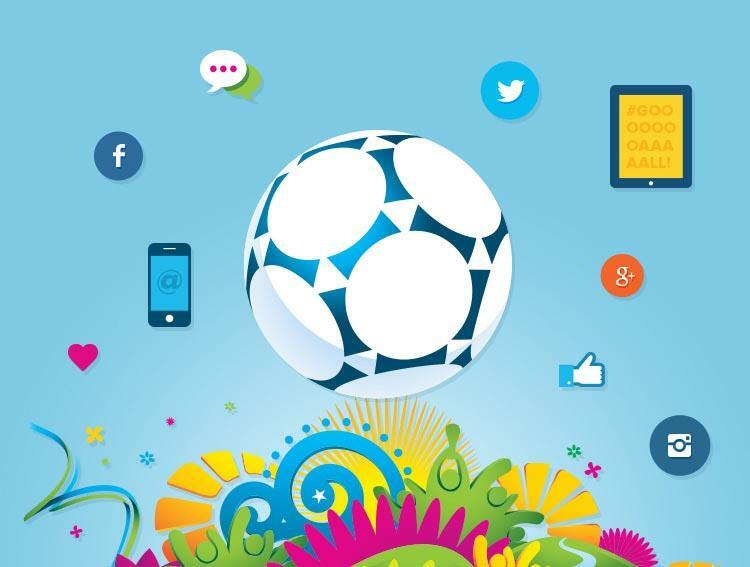 These top brands of World Cup advertising demonstrate real-time marketing savvy with integrated social media efforts that reach a global audience by effectively leveraging their digital campaigns. Brands must keep their campaigns simple yet powerful in order to translate their message across a wide variety of countries and cultures. As users around the world leverage the latest in technology to gain unprecedented access to their favorite events, marketers must communicate a powerful, unified message that connects with a real-time, global audience. When that happens, everyone wins. Published on July 10, 2014 .